Due to the nature of our Hosted Desktop service, sessions will sometimes go into the 'Disconnected' state. The disconnected state means that the session still exists and will remain available for 1 hour 40 minutes, after which time it will be logged off. If the user accesses Hosted Desktop within 1 hour 40 minutes after they were disconnected, they should go back into their original session, however, sometimes they will be taken into a new session. To prevent this happening, follow the below instructions. 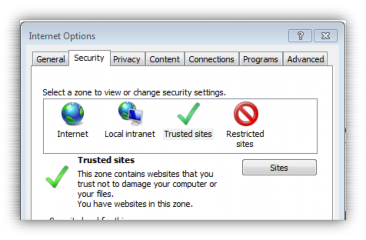 Select Sites and type https://login.cobwebdesktop.com into the 'Add this website to the zone:' box before clicking Add. You have now made the required configuration changes. The next time you are disconnected from Hosted Desktop, follow the below instructions to resolve the issue. 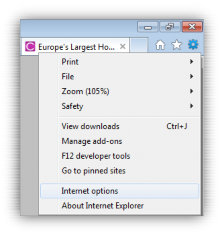 Close your internet browser and open a new session. Navigate to the Hosted Desktop login page (https://login.cobwebdesktop.com) and enter your user credentials as normal. You should now be returned to your disconnected session.